In my recent interview with James Wong (on The Ledge episode 13) we talk about the power of Instagram to inspire people, and to change the horticultural landscape in terms of plants that go from zero to hero (Coleus is definitely about to get cool, people ...). So I thought it would be useful to line up 10 of the many, many houseplant people I follow on Instagram - and you should too. I'm on Instagram as @j.l.perrone, and James Wong's there as @botanygeek, so why not come over and say hi? Jamie Song describes himself as "a plant hoarder" - so far, so Instagram circa 2017, but his photos are particularly impressive because you can see he hasn't just bought them. In some posts you can see the same plant photographed months apart, so you can see how it has grown and thrived. Jamie is founder of Founder of Bureau of Interior Affairs @bialondon, seller of vintage homewares and furniture, so he has excellent taste in containers, too. Darryl Cheng is huge presence in the houseplant world on Instagram, with 167,000 followers to date. If you want the information behind the pictures, follow Darryl's blog - it's worth it just for his awesome post on a flourishing (literally) relationship with his Monstera deliciosa. A self-described crazy plant lady with lots of scrumptious pics of her plants ... and her blog is rather moreish, too. UK-based Mark and Gaz of Alternative Eden are two of the loveliest blokes you'll ever meet and they also happen to have quite a touch with plants too. Check out their blog for pics of their house and garden plants, and some awesome shots of their koi carp too. A New York based grower who posts pics of her gorgeous houseplants - but doesn't shrink from showing the problem plants, the crispy-edged leaves that plague us all. Respect. Igor of Happy Interior Blog and Judith of JOELIX.com make up the team behind the hugely successfull community that is Urban Jungle Bloggers. They've got a book out and everything! 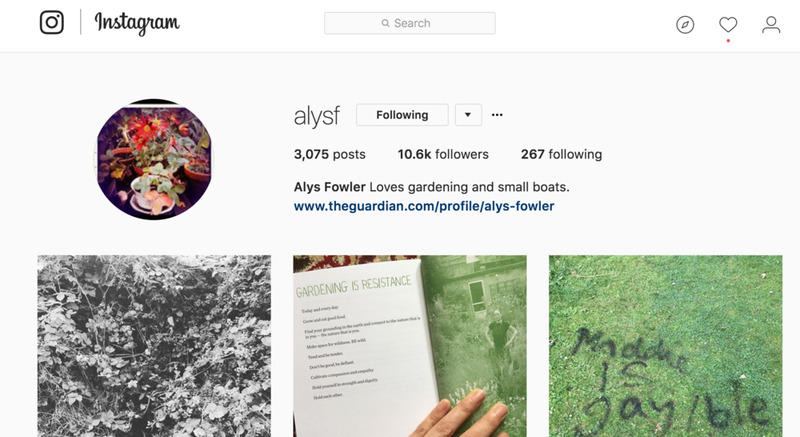 OK a bit biased here, because Alys Fowler was until very recently a work colleague, and I still count her as a dear friend, *but* Alys really is great on houseplants, as her new book Plant Love, out in September, will more than prove. Ian Drummond is a man to watch in the world of interior plant design. He's creative director at Indoor Garden Design and co-author of At Home With Plants. You can hear him interviewed in episode six of my podcast On The Ledge. Angela Rapisarda is an Italian living in Rotterdam and I just love her style.